The bubble stays in the tube! There are no escaped marbles to chase down. The bubble moves more slowly than a marble, permitting more accurate determination of elapsed time. Many data points can be collected in a short period of time. A Speed of the Bubble Apparatus to hold and protect the tube is easy to construct from scrap and/or inexpensive materials. It enables even very young students to obtain highly reproducible data quickly. It also protects the tubes from being damaged if dropped or bumped. Plans and suggested materials are included in this blog. The following experiment is one I use with the elementary students in our after school science club. per class of 30 students: 3 each of 15O, 30O, 45O, 60O , 75O and 90O blocks. From start to finish this experiment can be comfortably accomplished within one hour if the tubes are already installed in the apparatus. I first demonstrate how to use the apparatus, then ask the students at what angle they think the bubble will move most quickly and why. After recording their responses we start the experiment. Each pair of students selects an angle block; it makes no difference which degree value is chosen first. They push the block into the axis between the swing arm and base as far as it will go, securing it with the hook/loop strap. The strap is optional, but it makes it easier for the children to hold the block in place when they’re tipping the apparatus. One partner returns the bubble to the starting position before each trial by tipping the entire apparatus until the bubble gets to the end of the tube. She quickly, but gently, sets the apparatus base flat against the table as her partner prepares to start the timer when the front of the bubble touches the thirty centimeter line. He stops the timer when the front of the bubble touches the zero centimeter line. 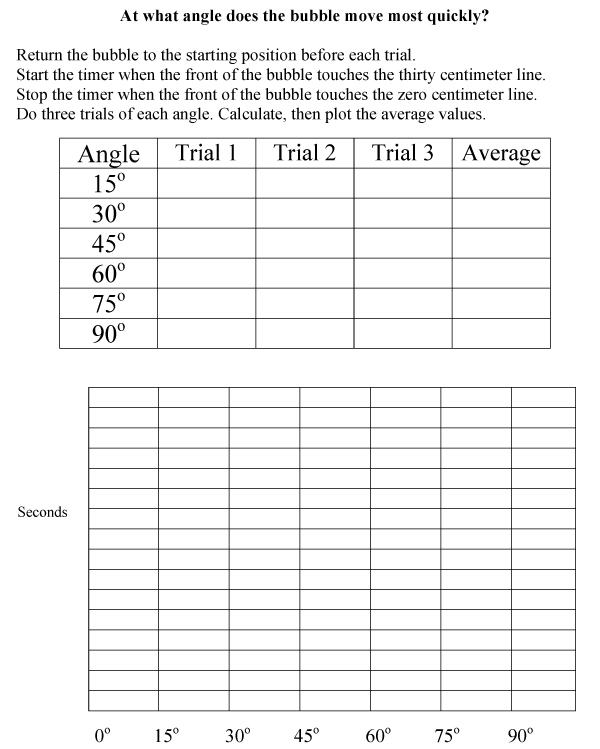 They do three trials of each angle, then calculate and plot the average values using a bar or scatter chart. When all teams finish collecting and analyzing their data, we compare and discuss the results. The student teams found that either 45O or 60O produced the speediest bubbles. Why might the same experiment produce two different answers? Does the difference between the 45O and 60O results fall within the experimental error? Is the real answer somewhere in between, perhaps 50O or 55O ? Does the color of the tube, i.e. the viscosity of the liquid, make a difference? 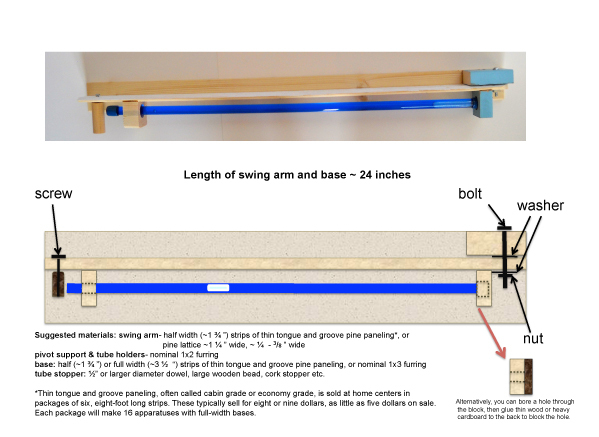 What are sources of error in the experiment, for example, what would be the effect of not holding the angle block tightly against the arm/base axis during each trial? How might the experiment be changed to answer these questions? How many significant figures should be recorded for the times? 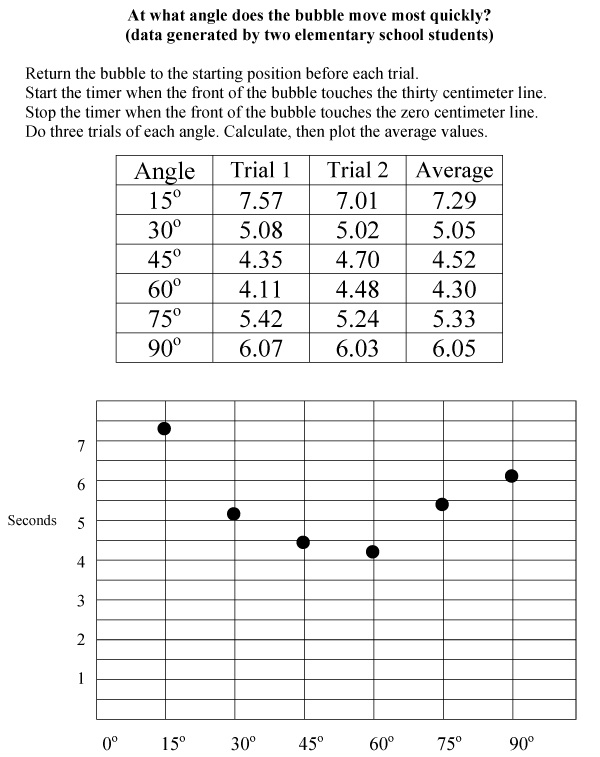 With additional time, students can determine if the speed of the bubble is constant throughout the length of the tube. The procedure is similar to that of the first experiment. Students measure the time it takes to travel 10 centimeters, 20 centimeters, 30 centimeters, and 40 centimeters, conducting three trials for each distance. Distance traveled versus average time is plotted on a scatter chart. Does connecting the data points yield a straight line? Is the speed constant? Discussion can include speed as the slope of a line, and, particularly if you have a calculator which automatically calculates this value, standard deviation. This entry was posted on Saturday, April 28th, 2012 at 9:43 pm and is filed under Elementary level, experiments, High School level, Middle School level, Physics. You can follow any responses to this entry through the RSS 2.0 feed. You can leave a response, or trackback from your own site. 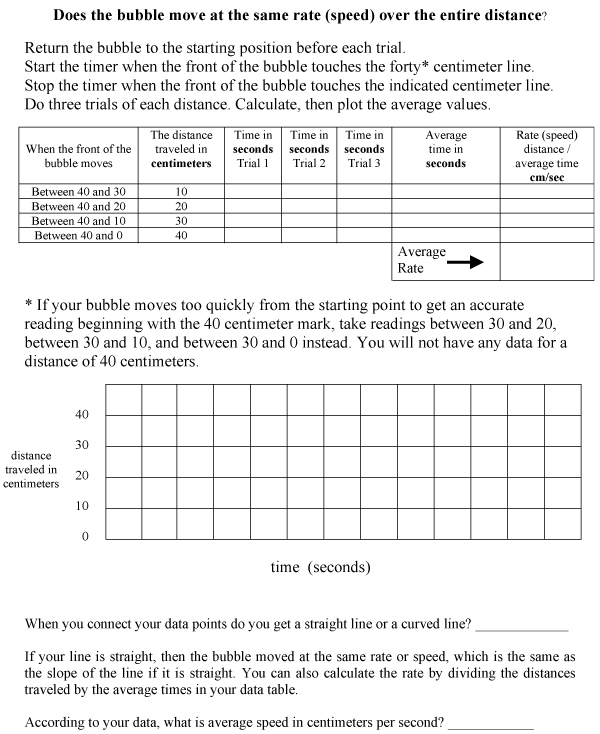 I was wondering if you could tell me what the equation is that is used to determine the best angle for the speed of a bubble to travel….my physics teacher has not explained this and I have been unable to find it anywhere. I have to admit, we do not have the equation readily available, however, if you ask your physics teacher I’m sure she/he can help you determine which equation would be best to use. Thanks for reading! Can you provide us with the oil in the tubes? We are trying to make a matching density column. Let me reach out to my manufacturer. I’m afraid the answer may be that it’s proprietary, but I’ll certainly ask and will get back to you. Do you know what liquids are in each of the tubes? We are curious and I can’t find the answer anywhere. Thank you!